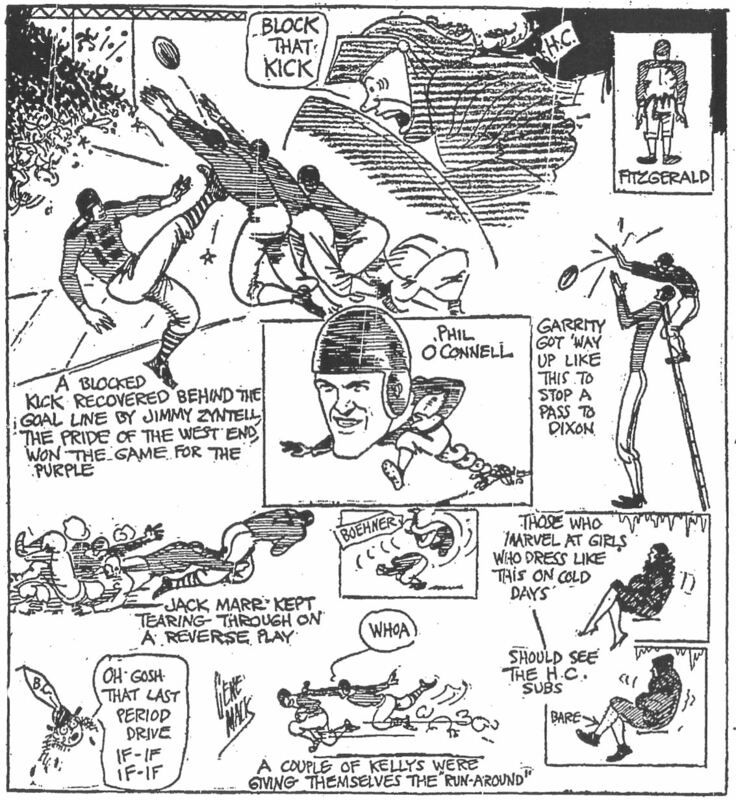 ON THIS DATE (November 29, 1930) ... After six years of waiting for a victory and five seasons of scoreless football against the Boston College Eagles, Holy Cross came through with a win at frozen Fenway Park, 7-0. The only score coming from the result of a blocked punt in the second period. These seven points were just about the difference between two really good football teams. And Phil O'Connell, the elite quarterback for the Crusaders was the one who spelled defeat for the Eagles. Holy Cross was magnificent from beginning to end, especially during the first half of the game. Holy Cross was constantly threatening the B.C. goal line with great plays and the splendid running of O'Connell. Four times the Holy Cross offense came within striking distance. A purple fumble and Eagle recovery stopped the first drive. A 15-yard penalty after a long pass to get them in scoring position, stopped the second drive. A fumbled lateral that B.C. recovered on the 20-yard line ended the third drive. And finally, the splendid defensive line of the Eagles, stopped the fourth threat. On the scoring drive, the purple had carried the ball only 12 yards from the B.C. goal. There the Eagle defense stood tall and threw O'Connell for a three yard loss, giving the Eagles the ball back on downs. The Holy Cross defense then held them to a punt on fourth down. George Colbert was doing the punting and stepped back on his goal line to receive the snap. Swede Anderson was the long snapper and sent the ball back high. 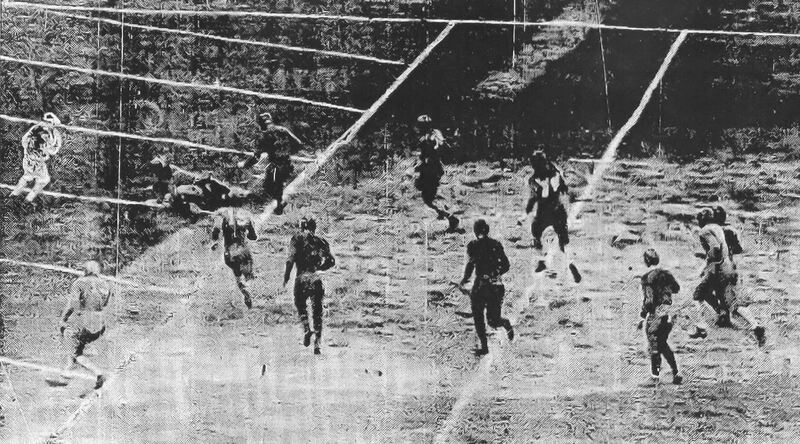 Colbert grabbed the ball and managed to attempt the punt, but enough time had allowed Crusader linemen Tony Colucci and Jim Cavalieri to penetrate and block the punt. The ball bounded back into the end zone where Ignatius Zyntell grabbed at the ball. He missed. Then Eagle, Chessy Santos tried to pick it up, but dropped it, allowing Zyntell to finally fall on the ball for the Crusader touchdown. That was the story of the game. Yet for this play, these two teams would have ended the game deadlocked. At times each had the other on the run. The Crusader's chances came early, the Eagles' chance came late. With less than two minutes, the Eagles had their chance. It started when Jack Marr picked of Phil O'Connell's pass at the Eagles' 37-yard line. Mike Vodoklys and Boehner first combined to get the ball to midfield. Joe Kelly and Vodoklys got the ball down to the Crusader 27-yard line for a first down. Another Vodoklys-Boehner pass and a Kelly run got the ball down to the 17. Time was nearly up and Vodoklys opted to throw a pass into the end zone as a final chance. But O'Connell went up and grabbed it out of the Eagles' claws and came down with the ball for the game ending interception. The game was smash mouth football and ion this day, Holly Cross did it just a little better.